or sink the teeth into a face. as if you’d need a reminder by then. and a whole lot of things with furry hair. to know maybe if the ends justify the means. new about poetry written by people who aren’t happy with the state of contemporary society and therefore retreat to a rural hideaway of one sort of another. It goes back at least to Wordsworth, who was so disabused of English society, a ‘fen of stagnant water’ and the ability of the French to ruin a perfectly good Revolution (‘Now do I feel how I have been deceived…Faith given to vanity and emptiness’), that he hightailed it back to the Lake District and stewed about things for years. ‘The world is too much with us; late and soon/Getting and spending, we lay waste our powers,’ wrote Wordsworth from his lair by the lake in Grasmere, and ever since, we’ve had poetic prophets telling us, from their sacred retreats, how much happier they are away from it all. Nothing wrong with that, of course, if you subscribe to the message yourself, and are told the message in language which is as contemporary and authentic to our time as Wordsworth’s was to his— with a reasonable level of modesty, of course, and providing that there’s no likelihood the messenger is going to turn into this year’s apocalyptic. I’m one of those who likes the ‘head for the hills’ message well enough, and after reading Grassroots (Wind Publications, 2010), by Jared Smith, I’m pleased to say that the author passes my ‘scratch’ test on all the preceding counts. Like particular social orders, grass, he infers genially, is meant by nature to burn from time to time. And the sound of wind blowing aspens between stars. Noting rather cryptically in his ‘about the author’ comment that he has left corporate society—where he was adviser to White House Commissions and National Laboratories—Jared Smith reveals that he retreats regularly to ‘a rustic log cabin without television, radio or cell phone coverage’ in the foothills of the Colorado Rockies. That’s some impressive distancing, biographically speaking. There’s plenty of distancing going on in the poetry too. By turns, Smith takes potshots at corporate society, bloated union workers, university professors, politicians and artists for losing sight of their essentiality. George Wallace is author of nineteen chapbooks of poetry, including Poppin’ Johnny (Three Rooms Press, 2009). He is editor of Poetrybay, Poetryvlog and other publications. 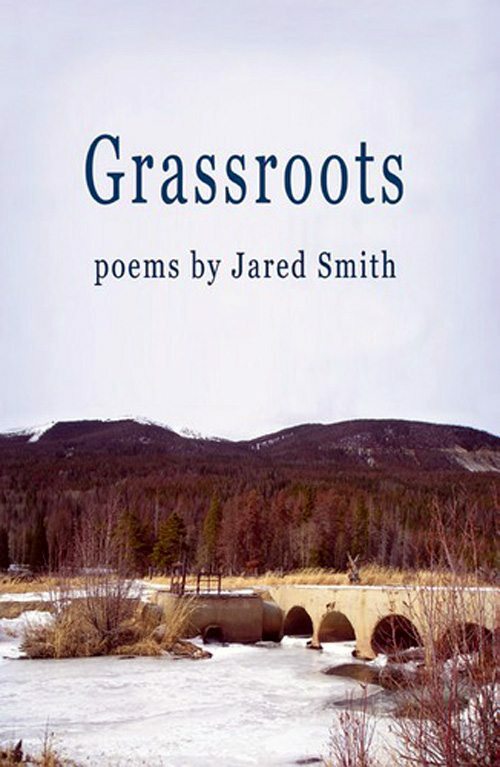 This entry was posted in Jared Smith and tagged Grassroots, Jared Smith, Poetry by Monsieur K.. Bookmark the permalink.